I've been thinking about the relationship between WWE PPV buys (both domestic & worldwide) and the poll feedback that is collected by this website and published in the Wrestling Observer Newsletter. I've looked at this issue before in smaller batches, but with 4.5 years worth of newsletters available, I decided to refresh all of the information and see what insights could be gleamed. The primary question I'm interesting in answering is "Does WWE PPV Poll Feedback in the Wrestling Observer Newsletter provide an accurate estimate of the actual number of PPV Buys?" I reviewed all of the Wrestling Observer Poll feedback for the modern issues which are available on the website; data available included the poll numbers (thumbs up/thumbs down/thumbs in the middle) for all WWE PPVs since June 2008 (starting with ONS '08). For PPV buys, I combined several sources - WWE's quarterly SEC filings, Dave's year-end PPV recaps and Dave's November 3Q Domestic/Worldwide PPV recaps. 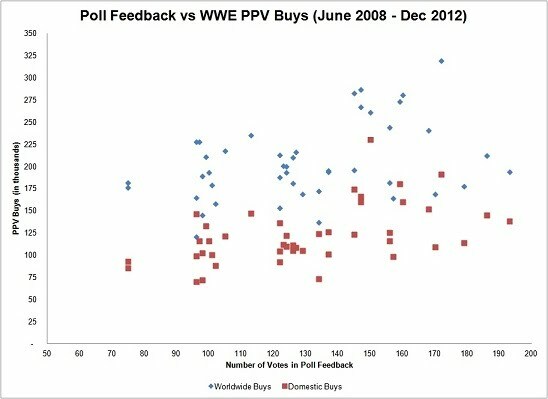 There is relationship a correlation between higher amount of poll feedback and higher number of PPV buys. Major PPVs - namely Wrestlemania and Royal Rumble (and also Summerslam) receive the most feedback and also have the highest number of buys. Among the B-PPVs (75-300 votes, 100k-300k buys), while the data is tightly clustered generally the higher feedback does correspond with slightly higher buys. This represents 45 PPVs with 200 or less votes and excludes "Major" PPVs (Royal Rumble, Summer Slam, Wrestlemania). Suddenly, the relationship became a lot murkier. * Over the past several years, worldwide PPV market has grown more through expansion into new markets rather than organic growth within existing market. This is also true to a degree with "domestic" buys as the number has been affected by growth in Mexican markets. * Flattening of month-to-month WWE PPV B-show buys (especially for B-shows without major star cameos such as Rock or Brock Lesnar). * Increase in amount of "alternative" streaming options for PPVs. This includes piracy (not sure where new media such as WWE app counts) which may generate poll responses but are not captured as traditional PPV buys. * Suggestion that sample size for this website is not sufficient to estimate worldwide or domestic interest between individual b-show PPVs. * Domestic percentages continue to fluctuate throughout the years: 65.5% for 2008 (9 events), 62.0% for 2009 (14 events), 55.8% for 2010 (13 events), 58.7% for 2011 (13 events) and 61.9% for 2012 (for 11 events). Does "quality" of the PPV affect the poll response? While these models seem authoritative, it should be noted that in both of these regressions the adjusted r-squared was below 30%. WWE Extreme Rules 2010 had 201k worldwide buys, 112k domestic buys and PPV feedback of 61 up, 39 middle and 23 down. Estimated domestic is 45861+605*61+713*39+401*23=45861+36905+27807+9223=120k domestic and 131593+602*61+463*39+572*23=131593+36722+18057+13156=200k worldwide buys. The model was pretty close. 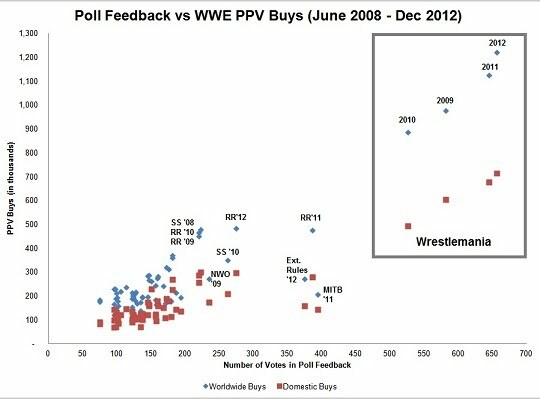 I was interested in isolating whether there was a clear relationship between # of poll responses and PPV buys. It is true in a macro-sense in that the major events (by # of buys) do receive far more feedback than the minor events. However, among the minor events, there was not a clean relationship between poll responses and actual number of worldwide or domestic buys. In other regressions, I have found that there may be relationships between PPV price points, strength of card (i.e. which stars are or are not appearing and use of "drawing" gimmicks such as Hell in a Cell), interest leading to PPV (such as ratings and number of weeks of "build"), time of year (build to WM vs winter lull) and other such factors which can be used to predict the number of PPV buys. However, in general, there does not appear to sufficient evidence that WO Poll Numbers for b-shows are strong and accurate predictors of final PPV buys number to a serious degree of precision. PPV buys were culled from the SEC filings, Dave's year-end domestic breakdowns and Dave's Nov Q3 PPV chart breakdowns.